Gov. Jay Inslee is joined by his son Joe, left, and his wife Trudy as he announces his candidacy for the presidency at A&R Solar, an installation company, in Seattle, Wash., on Friday, March 1, 2019. Inslee, a former member of Congress who has made climate change and the environment his signature issues, jumped into the crowded field of 2020 Democratic contenders for president on Friday. Inslee, 68, has led the state during a powerful economic expansion since taking office as governor in 2013, especially in the Seattle area. Amazon and other tech companies have hired tens of thousands of workers, and export-driven manufacturers like Boeing have boomed. In a video released by his campaign titled “Our Moment,” Inslee spares no time getting to his core environmental message, with the word “climate,” mentioned at least 10 times in just over 80 seconds. Inslee has framed his candidacy around themes that are deeply familiar to residents of his home state. Biting attacks on President Donald Trump and Republicans in Congress — popular in the strongly Democratic counties in and around Seattle — are combined with sometimes lofty, sometimes dire, rhetoric that the nation and the world are at a pivot point, where delay on energy and climate will be disastrous for future generations. “This is the 11th hour, but it is Washington’s hour to shine. It’s a time of great peril, but also of great promise,” Inslee said in his State of the State speech earlier this year. “I don’t know of any other issue that touches the heart of things so many of us care about: our jobs, our health, our safety and our children’s future,” he added, referring to climate change. 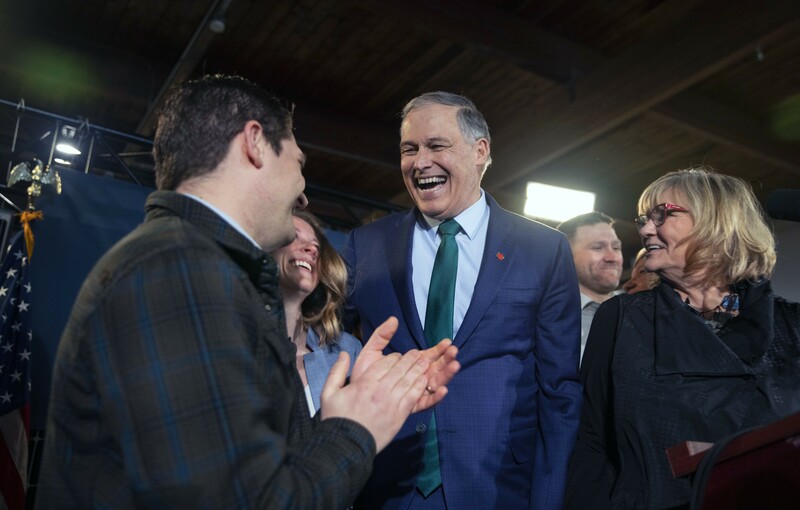 Inslee has said that he would push the nation to global leadership in research and development of lower-carbon energy policies, likening the effort to the mass mobilizations and deployment of resources during World War II.